From the Retro Collection. We designed this luxurious invitation back in 1991 using a variety of traditional illustration and printing techniques. The Barristers’ Ball was the marquis event within the Hartford legal community for years. Held amid the impressive collection of art at The Wadsworth Atheneum – the theme of this invite encouraged invitees to “Spend an Evening with the Great Masters”. 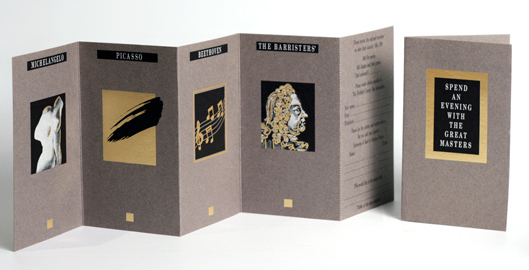 Featuring a series of hand-drawn illustrations, placing the Barristers’ on parallel with such notable artists as Michelangelo, Picasso and Beethoven – this impressive invitation utilized a full-range of specialty printing techniques including; foil stamping, opaque inks, double hits and engraving. The end result was a striking and unique invite that garnered several awards and managed to draw a record crowd at the event.